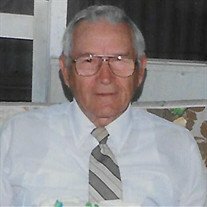 Walter W. Ehrat, 99, of Vandalia, Illinois, passed away Monday, January 14, 2019, at Willowbrook in Vandalia, IL. Services will be held at 11:00 AM, Friday, January 18, 2019, at Holy Cross Lutheran Church, Vandalia, IL with Pastor Joshua Frazee officiating. Burial will follow at Fairlawn Cemetery, Vandalia, IL, with Military Rites by Crawford-Hale Post #95 and Brownstown VFW. Visitation will be held from 9:30 AM to 11:00 AM, Friday, January 18, 2019, at the church. Memorials: Holy Cross Lutheran Radio Ministry, Vandalia, IL. He was born January 3, 1920, in Augsburg, IL, the son of William & Sophia (Schmid) Ehrat. Married Shirley Ann (King) Fravell, November 26, 1983, Maryville, IL. He retired from P.N. Hirsch Warehouse, Vandalia, Illinois and was a Farmer. Walter was a Member of Holy Cross Lutheran Church, Vandalia, IL; World War II Army Veteran; Crawford-Hale Post #95 American Legion and Fayette Co. Farm Bureau. He is survived by: Wife - Shirley Ehrat, Vandalia, IL; Children - Gary Ehrat & Judy, Vandalia, IL, Diana McMahan, Maryville, IL, Mickey Fravell & Debra, Worden, IL, Gale Stahlhut & Steve, Alhambra, IL and Kimberly Keller & Earl, Bunker Hill, IL; Grandchildren - Todd Ehrat and Kathy and Michael Ehrat & Cindy; 10 Step Grandchildren; 18 Great Grandchildren; 1 Great-Great Grandchild; Sisters - Grace Albrecht and Berniece McCoy. Preceded in death by: Parents; Brother - Arthur Ehrat; Sisters - Dorothea Albright and Ruth Russell; Step-Daughter - Linda Bates & husband Charles "Bill".